Cynthia Brian, ASID, NY Times best selling co-author of Chicken Soup for the Gardener's Soul , author of Be the Star You Are!®, 99 Gifts for Living, Loving, Laughing, and Learning to Make a Difference, The Business of Show Business, and Miracle Moments®, is an internationally acclaimed key note speaker, personal growth consultant, host of radio and TV shows, syndicated columnist and acting coach. (www.star-style.com) Cynthia Brian is often referred to by the media as "the Renaissance woman with soul!" She is a world traveler who speaks French, Spanish, Italian, and Dutch. With nearly three decades of experience working in the entertainment field as an actor, producer, writer, coach, designer, and casting director, she has had the honor of performing with some of the biggest names in the industry. Cynthia is a Certified Interior Designer and has had her interior and garden design projects featured in TV, commercials, books, and numerous publications. 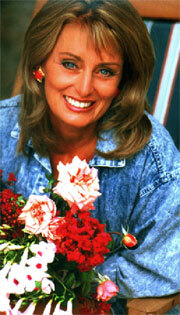 Her licensed line of garden and interior furnishings, Starstyle® by Cynthia Brian will be debuting in 2007. Cynthia is a much in demand speaker on luxury cruise lines and spas around the world inspiring others to be the stars they were born to be by creating a life they design. Because of her devotion to increasing literacy and positive messages in the world, Cynthia founded and is CEO of the 501(c)(3) charity, Be the Star You Are! (www.bethestaryouare.org) empowering women, families and youth at risk. Her motto is "To be a leader, you must be a reader!" Since it's founding in 1999, Be the Star You Are! has served approximately 46,000 individuals and families within 46 organizations and has logged more than 105,900 volunteer hours, while distributing over $1.4 million in resources. As Cynthia likes to say, "We're small yet MIGHTY!" Interviewing is a talent this dynamic woman enjoys. Tune into her upbeat positive nationally syndicated radio program live and archived every Monday from 1-2pm PST/4-5pm EST on World Talk Radio. (http://www.worldtalkradio.com/show.asp?sid=118). When you are seeking a seasoned professional for your next project who is a wife, mom, and business woman with exuberance and personality that garners results, Cynthia Brian is the lady to call! Page delivered in 0.00186 seconds.